Postcards from the Road: Series 001 — Blake Erik. As a 21 year-old, I consider myself incredibly lucky to have seen the places that I've seen, and I try to document as much as I can in pictures just because I never want to forget any of these places. Here are 10 photos from the road, in a first instalment with more to come, with this being SERIES 001. PS. All these photographs have been turned into actual postcards I'm really stoked about, and you can get one for yourself at the shop! Keep your eyes peeled for the announcement bar above in the header for any special promotions and discounts ongoing! This field of lavender flowers was on a trip to Sydney, Australia in what would've been Spring in Australia. We rented a car for the day to drive up to New South Wales' wine-producing region, Hunter Valley. A drive just over 2 hours from the city took us through small towns such as Pokolbin and Cessnock. The fastest route would've been on the M1 freeway, but we decided to deviate from the mundane motorway humdrum and followed Tourist Drive 33 to get us to Hunter Valley. Personally, I would've traded the extra half hour through country roads with a shorter albeit unexciting drive on the M1 though, as there wasn't all that much to see in the small towns. Within the valley, we drove around from winery to winery, including one of the most famous ones in the area — Audrey Wilkinson Vineyard. Unfortunately, they were closed by the time we got there, but the vineyard was huge and that's where I found this small bunch of lavender flowers blowing in the wind. I turned 21 this June and I spent it in Perth, Australia with my family and had a great time. I was often shot with a, "but there's not very much to do in Perth," remark, even from Australians themselves, but I actually liked that it was pretty chill and I found quite a fair bit to see (provided you're willing to make the effort to travel), but I'll save that for another time. Unlike our time in Sydney, we had to drive in Perth as we were interested in driving out of the city quite a lot. And honestly? Western Australia had some of the most incredible landscapes these young eyes have ever seen. From rolling green hills to lush sand dunes to sparsely populated towns to views of the Indian Ocean, there was plenty to see on drives north or south of the city which we did. I did most of the driving that trip, but on the occasion my brother took over the wheel, I snapped this picture from the passenger seat. Dusk was falling and we very much wanted to avoid the kangaroos that become active at dusk and dawn. The sun was setting and the sky was reddening, casting longer shadows on the roads and the way the light fell was kinda perfect. I don't think I'll ever forget this one drive in particular. I've realised that I'm a city boy through and through, and there's something about traversing through a packed city, rubbing shoulders with strangers on subways, and looking out at skylines that will always get me. It's the buzz, it's that feeling of being somewhere where you can be an absolute nobody but become a somebody at the same time. It's where things happen, and I like that excitement. Prior to this trip to Tokyo in the winter of 2014, I'd been to Japan before, but oddly never explored it's capital before. So when my Aunt packed her bags for Tokyo for a business trip, I gleefully tagged along. Her itinerary meant we would be in Tokyo for a full week, so I did my research and planned where we would head. In particular, I really wanted to see Tokyo's skyline. I had a few options, namely Roppongi Hills, a tower in the district of Minato for ¥500, and Tokyo Skytree in Sumida for ¥2, 000 to ¥3, 000. However, I took a separate third option because I read that it was free, and that option was up the Tokyo Metropolitan Government Building. There are two observatory decks, namely the North and South, and I chose the North mostly because it's open from 9:30am to 11pm, and I wanted to catch the sunset over the city. And so I waited for dusk to fall and for the city to awake with light, and that's when I took this photo. On our last day in Sydney, we had a flight to catch at 6pm, leaving us with the morning free. I desperately wanted to make the most of my time in Sydney and see as much as I could, so we hopped on a ferry from Sydney's Circular Quay to Watson's Bay, a harbourside suburb of Sydney. Thankfully, the weather was brilliant, the sun was out and so were the blue skies, making the ferry ride a scenic one. When we pulled into the wharf at Watson's Bay, we headed to The Gap lookout, a scenic lookout facing the ocean before we settled for lunch at Watson's Bay Beach Club Restaurant. Not content with the few hours I only got to see of Watson's Bay, while my family waited for our food, I quickly headed to Camp Cove beach, a small bay tucked away at the end of Cliff Street, where I feel like I captured the essence of Watson's Bay in a snapshot. While living in Barcelona at 19, I wanted to explore as much as I could of the city and its surroundings. One of the top options for day trips out of the city was Sitges, a small town just half an hour away by train. Popular with expats and retirees, Sitges was a sleepy town when I visited in the winter of 2016. Within the main town square and its surrounding streets, shops were open and people were out and about, but my favourite part was getting lost in the cobblestone streets, which were completely empty save for a few residents going about their daily business. And there was just something about the quiet charms of these towns. 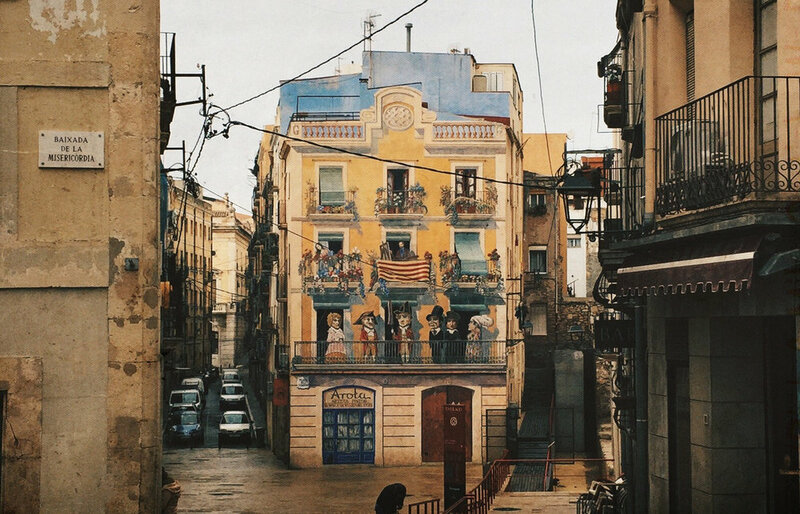 During my jaunt in Barcelona, I scrolled through endless pages on the Internet for nice towns I could visit, and Tarragona was another that came up. Slightly further south of Barcelona than Sitges took us to Tarragona, this time an hour on the railway. I was attracted to the town for its history, as it was once occupied by the Romans, and much of the sights retained from that era remain the crowning jewel of the town. Plus, some Roman influence would've given us something different to see in Catalonia. We visited Tarragona's Roman Amphitheatre (Amfiteatre de Tarragona), which is located next to the sea, and Tower (Torre de les Monges), but the most impressive for me was the Roman Circus (Circ Romà de Tarragona), where we got to see the open-air and underground ruins of a 1st Century CE chariot-racing track from the Roman era. We got to scale the accompanying tower, where we got this magnificent view of the town. And just like how we did Sitges, there wasn't a fixed agenda for the day, we just walked and walked and walked wherever our feet would take us before we hopped on the train back into the city. This mural in particular I would find after I took this, happened to actually be a pretty famous mural at Plaça dels Sedassos. In fact, I'd wager that sometimes the best discoveries are those you didn't actively seek. And as you can already tell, Tarragona had a fair few more brightly painted buildings than Sitges, which more than added to its charm. It was Christmas in Barcelona, the layers were getting thicker and nights were getting cooler. "Bon Nadal" and "Feliz Navidad" started springing into the streets, alongside the obligatory Christmas lights all around. But the best part about Christmas in the streets has to be the Christmas street markets that come alive. Barcelona may not be quite the place people flock to for Christmas markets unlike other places in Germany or Austria, but I stumbled onto one at the courtyard of the University of Barcelona. Vendors were all around hawking their wares, creations, food & drink. This neon sign greeted visitors at the marketplace, and I thought about all those that were spending Christmas wishing someone was there with them. While in Barcelona, I wanted to scale the surrounding hills and mountains around the city just so I'd find the best vantage point. One of my favourites was up Tibidabo, a mountain overlooking Barcelona. A quick bus trip from downtown at Plaça Catalunya took us up winding roads. The most impressive view at Tibidabo is up the church Temple Expiatori del Sagrat Cor where you could see the theme park below, and the city below the theme park. And what's more classic of a theme park than a brightly coloured ferris wheel up in the mountains? When my time in Barcelona came to end, I stayed a month in Europe just travelling around, and reconnecting with family which meant the world to me. In my short time in Italy (I deperately need to go back, there are so many places I'm dying to go to), Rome actually stood out as a favourite of mine. We'd come from a few days in Milan, which while pleasant, didn't blow me away. And the skies cleared and sun showed when we were in Rome which I think had a vast impact on my feelings toward the two cities. In general though, I found Rome a lot more storied and interesting, whilst also being incredibly beautiful. We may have been walking on the ground but I definitely kept my gaze up in hopes I'd see more views like these.